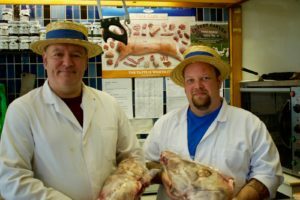 We all love a good sausage roll, and there’s no substitute for those you make yourself. Try this lovely recipe submitted by the lovely Helen. The secret to great pastry is not to over handle it. Don’t be tempted to squeeze it or to keep rolling out. This is a quick, rustic bake! Mix salt and flour together in a large bowl with a round-ended knife. Add the fat to the flour, stir with a knife and using your fingertips lift the flour mix up slightly and gently rub between thumb and fingers as if you were dusting flour off your fingertips. I just use one hand for this in a light, quick movement. Ensure you have mixed in all the larger lumps so the mixture resembles fine breadcrumbs (about a minute). Give the bowl a gentle shuffle to raise larger lumps to the top. Slowly begin to add about 45-60ml (3-4 tablespoons) of cold water, starting with the first two spoonsful (30ml) sprinkling evenly over the surface and then cautiously adding little by little until the mixture starts to come together using a knife. Put your hand in and scoop the edges and bottom of the bowl, pressing slightly and add another half tablespoon (7ml) to the breadcrumb residue. Add just enough water to collect it together into a rough ball with your hand; this will vary depending on your flour. Leave to stand in the fridge or cool place. Generously flour the centre of your board to the length of the sausage meat pack. Pull the fastener off the pack of sausage meat and squeeze it out from the sealed end on to the flour (or slit along the length of the plastic with scissors). Roll sausage meat once in the flour and then using a flour-sprinkled knife to deter sticking, cut the sausage meat lengthways in half. Roll each half in flour and extend the length to about 32-34cm (14 inches), depending on the diameter and size you want to cut the finished rolls. I prefer the chunkier thickness. Move both to the back of the board. To roll out the pastry, ensure there is a little flour on the board and rubbed on the rolling pin. Don’t flour the pastry. 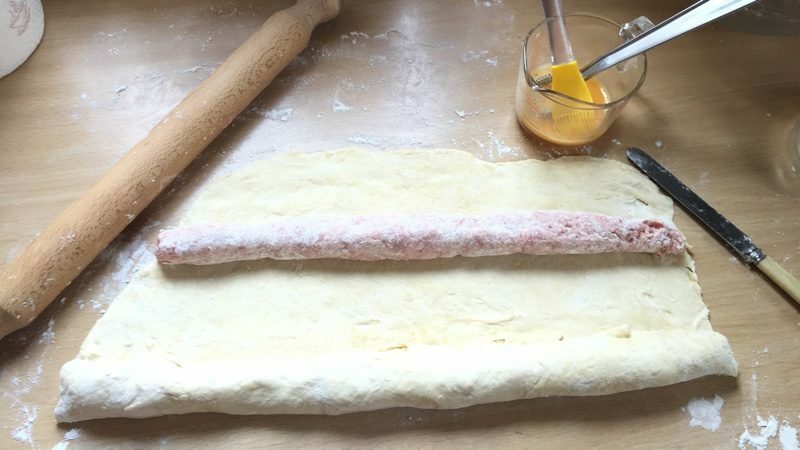 Roll out the dough in long smooth strokes in one direction, making a rectangle as long as your sausage meat rolls. Don’t pull or stretch it! Place one sausage meat roll on the pastry and flip the pastry over it so that it leaves about 1cm (half inch) overlap. Unwrap it and put meat to the back of the board and then roll out the pastry to get double this width of pastry. Concentrate on getting the corners roughly square (as this will save time patching later, but don’t over roll). See picture below. 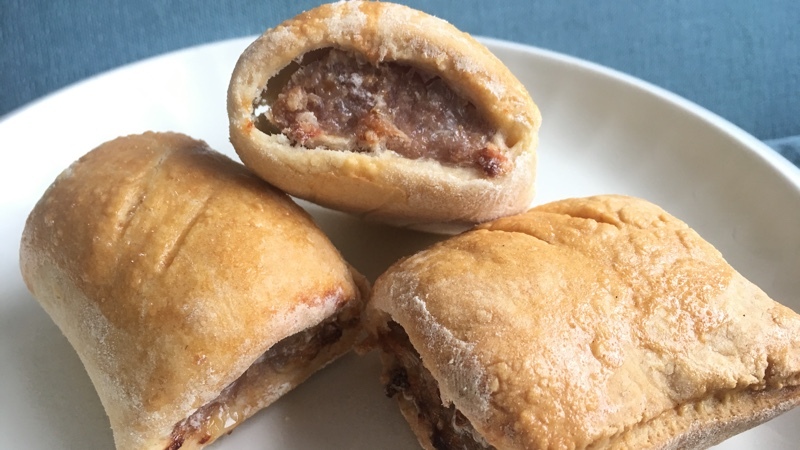 Place both lengths of sausage meat parallel on the pastry allowing space to wrap over each roll (from outside edge to inside) and for the pastry to edges to meet in the middle. Cut the pastry lengthways along this middle line. With a small brush, paint the egg along the length of the sausage meat and along the edge where the pastry will meet itself. Wrap the pastry over the meat and push down gently with fingertips to seal. Do this with both pieces. There may be a little excess at your edges, so you use this to patch up if required using a little egg as a ‘glue’. With a floured knife cut each length into about 6-8 sausage rolls (depending on your preference), and tap each roll end onto the floured board to seal in the loose meat. Make two diagonal slashes across the top of each individual sausage roll to let out the steam. Place on a baking sheet, brush the tops with egg and pop into the oven. Try to allow to cool down before eating!